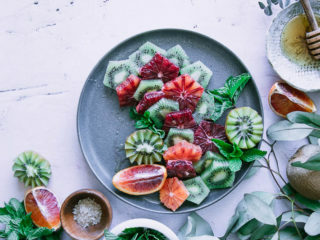 Blood Orange Kiwi Mint Salad, a simple winter citrus fruit salad with blood oranges, kiwi, fresh mint leaves, and a sprinkle of flaky sea salt. A simple seasonal treat! This recipe was originally posted in February 2017 and was updated for clarity and with new pictures in January 2019. When you think of winter, do you think of fruit salads? If your answer is no, I’m here to change your mind. 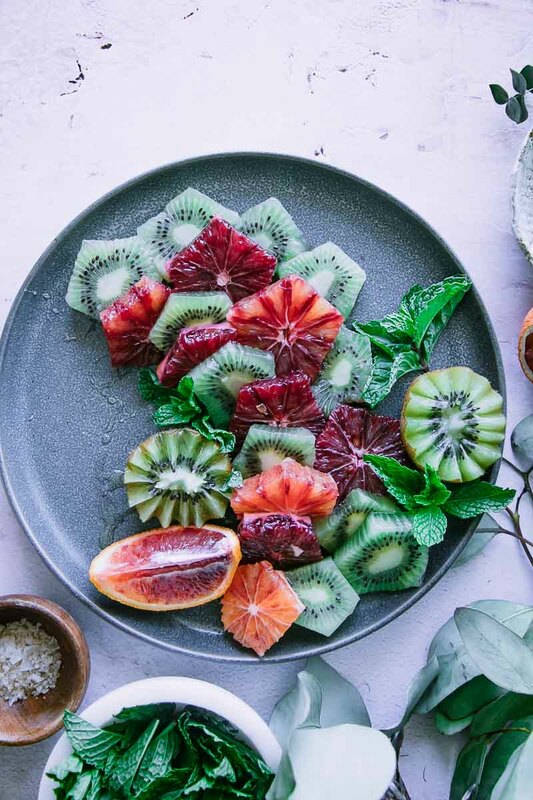 This Blood Orange Kiwi Mint Salad combines all of our favorite things about winter fruit: slices of tart blood oranges that fill the winter markets, fresh tropical kiwi, and a drizzle of honey and a sprinkling of mint. Top it all off with a bit of flaky sea salt for balance, and you have your new favorite winter fruit treat. 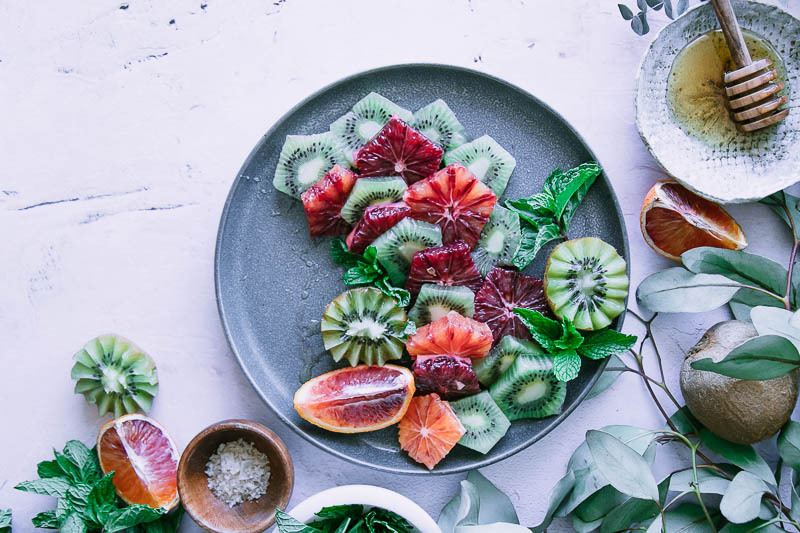 Ready to learn how to make this so-simple five minute, five ingredient Blood Orange Kiwi Mint Salad? Let’s do it! This simple winter citrus fruit salad comes has only five ingredients and comes together in under five minutes, making it a great easy snack or a simple appetizer or dessert when you have health-minded guests. First, you’ll need to cut the fruit. Slice both the blood oranges and kiwi into 1/4 inch (about 1/2 centimeter) slices and then cut off the skins. Next, arrange the fruit on a plate and then drizzle with honey. If you want to keep the recipe vegan, a bit of maple syrup or an infused simple syrup is also a great way to add a touch of sweetness without the honey. However, you could also skip this step and the fruit salad will still be delicious. Finally, top the salad with a bit of mint and a sprinkle of flaky sea salt. The sea salt is optional, however the slight saltiness really balances the sweet honeyed fruit and the mint. Here at Fork in the Road we’re all about eating locally and with the seasons, so unless you live in a tropical location likely the kiwis (and even the oranges) have traveled far to get to you. 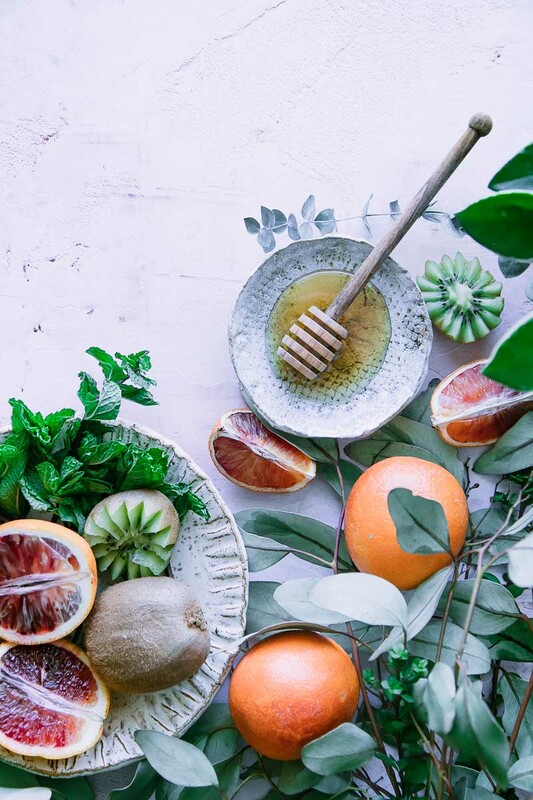 This doesn’t mean you should nix tropical fruit forever; what it means is tropical fruits can be viewed as a treat and savored when you do purchase them (fair trade, of course). Love this simple simple winter tropical fruit recipe? Check out our other recipe with blood oranges, like this Blood Orange Kiwi Margarita or this Blood Orange Frozen Berry Smoothie. 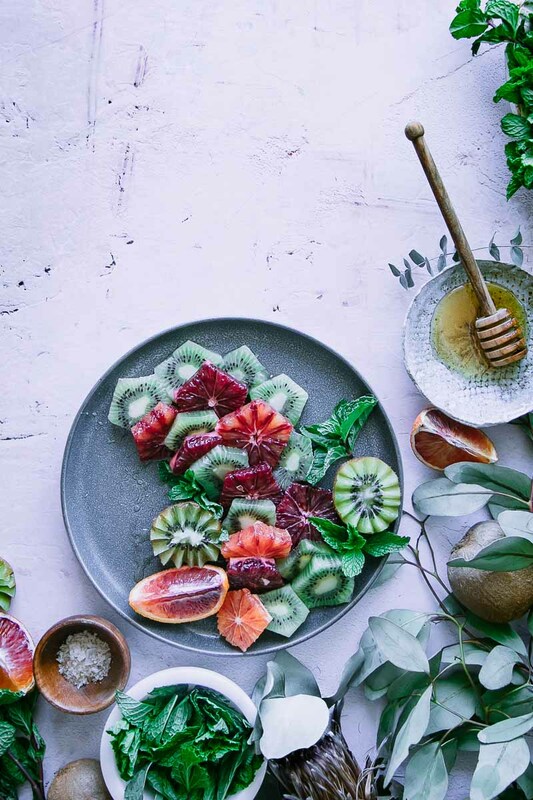 Did you make this Blood Orange Kiwi Mint Salad? Leave a comment below and rate the recipe to let us know how it turned out. Save this citrus fruit salad recipe for later by pinning to your favorite winter Pinterest board and make sure to tag me on Fork in the Road’s Instagram to show me your citrus salad creations! Slice oranges and kiwi into 1/4 inch rounds, then slice off peels and arrange on a plate. Drizzle honey, top with mint leaves. Nutrition notes: nutrition information is an estimate and is based on two servings. This recipe is a good source of fiber and is high in vitamin C.
This was really good! I can’t believe how simple it was, just cut winter fruit and honey with mint. But it had a lot of flavor and I think this will be good to share when I have guests. Thanks!